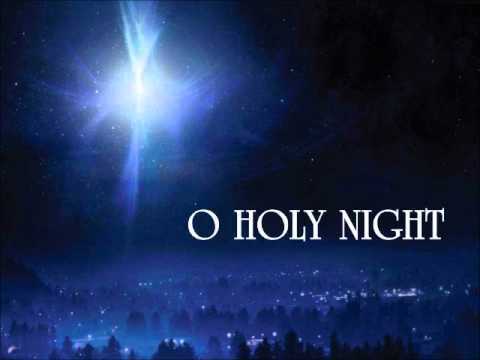 The carol, “O Holy Night,” takes me back to the pew of my childhood church where I listened to a gifted soloist, my mother, sing that Christmas hymn. I remember anticipating the high notes—so rich, clear, and resonant. The lyrics, including “Let all within us praise his holy Name” came from her heart. 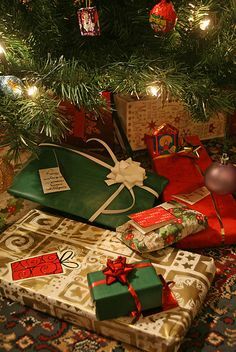 Red, green, and white tissue paper remind me of the gifts our grandmother would pile under her tree for my brother and me (her only grandchildren). You would think Grandma Clara’s shopping budget was unlimited, to see the number of packages. But what she lacked in funds Grandma made up for by shopping for super-bargains all year long. The tissue was probably an economical way to wrap some of the packages, so her precious dollars could be spent on what was inside. 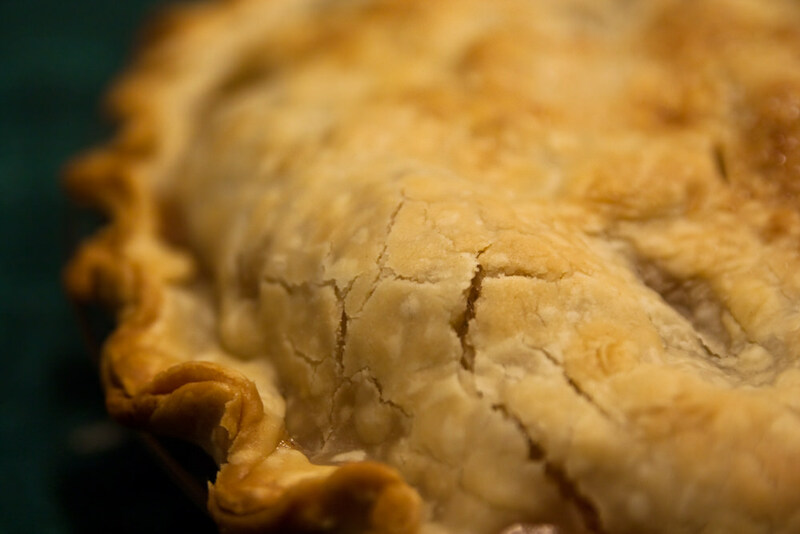 The aroma of pies, cookies, or breads baking in the oven take me back to Grandma Rachel’s kitchen. No one’s piecrust was as flaky, no cookies as perfectly browned on the bottom, no Parker House rolls as tender. And no holiday was complete without these treats. 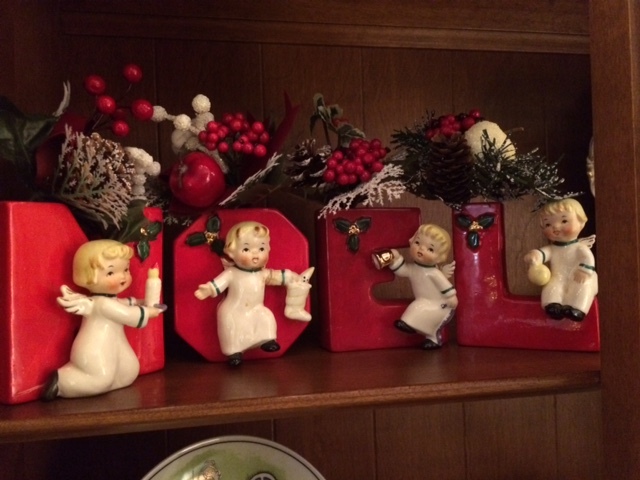 Red N-O-E-L letters with angel cherubs adorning each one remind me of childhood home #3. My mother would perch them on the sill of the leaded glass window by the stairs. I don’t know what happened to Mom’s set, but Steve’s aunt had the same ceramic letters and we eventually inherited hers. Now I’m the one who lines them up each year. Not one of these memories is attached to a significant event, yet they are precious treasures of my heart. Now why would that be? Is it just the nostalgic atmosphere of the season that seems to envelope many of us at Christmastime? 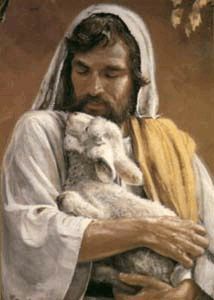 I first experienced the love, peace, and security of God the Great Shepherd within the fold of my loving Christian family—not just during the euphoric season of Christmas but all year long. Memory after treasured memory give proof, and I am so very grateful. I thank you, Father, for treasured memories of the heart, and for the love, peace, and security my family provided throughout my growing years. I praise you as the Source of those glorious qualities. How can I not be grateful? What Christmas memory speaks love, peace, and security to you? Tell us about it in the comment section below! *After forty years in Florida, my husband and I moved back to the Midwest in 2014 to be near our sons and their families. 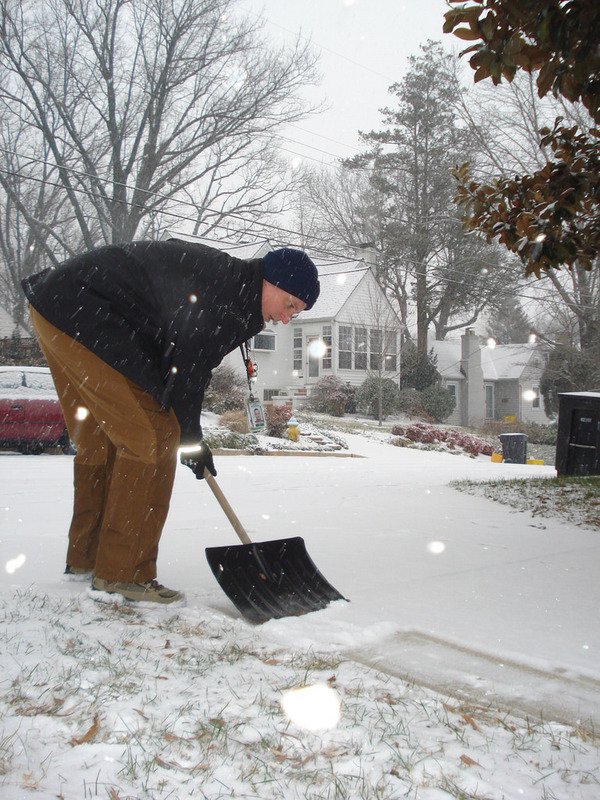 Imagine my delight to hear that shovel-on-concrete sound again after so many years, and have that ancient memory come bubbling up from the depths. Oh, Nancy! Precious! Our children are now all in their thirties and spread around the globe, but I hope that they also have these kinds of memories that come back, especially as they get older. Blessings to you this Christmas!! Thank you, Dawn. I think all of us grow in our appreciation of precious memories as we get older. Your children will surely do the same! Merry Christmas to you, blogging friend! Beautiful, thank you! O Holy Night. Thank you, Carole, and Merry Christmas! You have wonderful memories Nancy. I remember receiving roller skates that you put on with keys, even living in Ohio and it being cold, I had to put on those skates and skate down the sidewalk. It would be wonderful if the whole world was at peace with God and celebrate the birth of Jesus , what a gift and blessing it would be. Merry Christmas to you and Steve and your precious family. I enjoyed my clip-on skates, too. ‘Not surprised you had to try out your new ones, bitter cold as it was. I would have, too. Someday, Laura, we WILL enjoy peace on earth–the new earth–and celebrate our Savior as we’ve never done before! It’s going to be AWESOME!! Merry Christmas to you, dear friend! Thank you, Diane. It was a delightful day! My mom loved crafts, so I very much associate Christmas with her decorations. And with food. And gifts–sheesh, I was a materialistic kid. But, yes, underlying all the “stuff,” I think, was that sense of love and security. Thank you, Ruth. Indeed, as the blessings continue to flow through children and grandchildren, our joy and gratitude grows all the greater. Merry Christmas to you, too, dear friend! How could I have forgotten singing the Hallelujah Chorus in chapel?! Thank you for reminding me. Other precious memories of singing that piece at various churches come to mind each Christmas and Easter as we hear the majestic chorus again. I never get tired of it. I’ll bet your family loved those “Night before Christmas” performances! Beautiful writings of beautiful memories, Nancy. Thank you, Grace. I’m so glad you enjoyed the reminiscing! Thank you, Marcus. I am honored you considered this post worth sharing. Praise God for his inspiration!